Oral and maxillofacial surgeons cover a wide spectrum of corrective and cosmetic surgery including head and neck cancer, corrective jaw surgery, cleft lip/palate and craniofacial surgery, treatment of traumatic facial injury, facial cosmetic surgery, dental implant placement and wisdom tooth removal. From the moment I stepped onto Mount’s campus, I was struck with the sincerity of the faculty and administration, as well as their collective investment in the growth and maturation of each student. I was looking for a campus community that would be able to provide the tools and opportunities for me to explore my potential and challenge myself as a student, and Mount truly surpassed those expectations. Whether it was one-on-one interactions with my faculty mentors, group discussions in one of my many seminar courses or speaking with visiting lecturers regarding issues currently being faced in their respective fields, Mount never ceased to broaden my perspective and foster my maturation as a student. Without question, Mount’s greatest strength is its ability to provide students with incredible faculty mentors. Between Mount’s smaller class sizes and the greater flexibility students enjoy in choosing courses within their major that most closely align with their interests, Mount Union facilitates the pairing of students with faculty who can truly relate to their students on a personal level. It is this greater connection that students feel with their instructors that helps to solidify a mentoring relationship that, ultimately, proves invaluable. The greatest aspect of these mentors is the depth and breadth of Mount’s faculty members, who not only serve as a phenomenal example for students in terms of career interests and academic pursuits, but also provide students with such sincere examples of true leadership and service. From my first day on campus, Drs. Jeffrey Draves, Debra Boyd-Kimball and Scott Mason quickly emerged as lasting mentors for me during my time at Mount. Dr. Draves remained a continual source of encouragement and challenged me as a student, helping me to establish independent research efforts while facilitating my career pursuits. Dr. Boyd-Kimball served as a pivotal mentor for me as a biochemistry major and embraced my insatiable curiosity, allowing me the latitude to drive my senior thesis in a more medically based direction. Finally, Dr. Mason functioned as my “pre-health” advisor who continually worked to create opportunities for me to increase my exposure within the medical field in anticipation of my entrance to dental school. Ultimately, these three faculty members became such an integral part of my success at Mount, and I continue to think of them, and the invaluable wisdom they passed along, each day as I progress in my career. 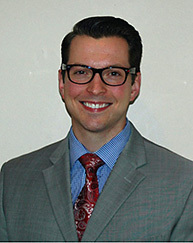 Immediately following the completion of my bachelor’s degree, I began working as a student researcher in The Ohio State University College of Dentistry’s Division of Oral Pathology and Radiology. That fall, I then began my dental training at Ohio State to obtain my D.D.S. I had two internships during my time at Mount Union. The summer after my sophomore year, I completed a research internship at NYU in New York City as a part of the National Science Foundation’s Research Experience for Undergraduates (REU). During my internship, I worked with researchers as we aimed to develop and test the 3-D printing of surgical scaffolds for the repair of bone defects. Dr. Draves was extremely influential in advocating for me to receive this research opportunity and compiled my recommendation for the internship application. My second internship was completed the summer after my junior year as I served as a researcher within the University of North Carolina’s School of Dentistry. During this experience, I worked with a team of researchers assessing the viability of salivary biomarkers in monitoring blood glucose in patients with Type 2 diabetes. Dr. Boyd-Kimball was an essential part of me securing this research internship and encouraged me to further develop this research as the foundation of my senior thesis. During my time at Mount, I was involved in Alpha Lambda Delta, American Chemical Society, Pre-Health Professions Club, Sophomore Service, Blue Key National Honor Society, Student Senate and Raider Relief. I served as the president of Sophomore Service and Blue Key, while also serving as the president of the Class of 2011. During our time at Mount Union, I worked with Jay Carpenter ’10 and Mark McConnell, professor of marketing, to form the Raider Relief organization. I received a Doctor of Dental Surgery degree from The Ohio State University in May of 2015. I have begun my residency training at Vanderbilt University Medical Center to receive my Doctor of Medicine as well as my certificate in oral and maxillofacial surgery. I left Mount fully confident that the biochemistry and pre-med background I received would equip me to perform well at the next level, but it was the greater exposure I had to various other fields due to the liberal arts education that really substantiated the success I would find after graduating from Mount. Mount Union taught me more than I could have imagined about what it means to truly be an effective leader and the emphasis that must be placed on service back to my academic field and community. These life lessons have remained extremely influential for me as a clinician as I interact with my patients daily, working to relate to them in an effort to provide the highest quality of care possible. I work to stay connected to Mount Union as an alum through many of the networking opportunities I have been fortunate to have had with executive board members and alumni throughout the state and country functioning within the healthcare field. Additionally, the fantastic resources distributed by the University, such as the Mount Union Magazine and other online resources, are very helpful in maintaining a strong connection with recent University updates and developments. I would really love to establish an initiative that can have a lasting impact within the community. Whether it is in the form of a community outreach program or a more global missions effort, I truly feel a calling to give back and pay forward the incredible blessings that have come my way. Far too often, I think it’s easy to lose track of our purest motivations as our lives become more and more chaotic. My education at Mount helped me to more fully appreciate the gifts and blessings that have been integral in my progress, and I therefore feel it is my responsibility to remain conscious of those in need and whose lives we could irrefutably transform. As I begin the next phase of my career and work to clarify the means by which I can have such a lasting impact, I remain anxious for the opportunity to collaborate with other individuals across the country, especially Mount Union alumni, to pull from their vast expertise, resources and passions. My education at Mount has proven to be a fantastic investment as it’s molded me into the leader and clinician that I am today. The faculty at Mount truly pushed me to take nothing at face value, and always ask the invaluable “Why?” I think it’s that curiosity and drive that my education at Mount emphasized that has proven to be most valuable because it spans all aspects of your life. The lessons and wisdom I gained at Mount were not just applicable to my professional development, they helped me mature and grow into the citizen the faculty who taught me hoped my classmates and I would become. The patients. I have the opportunity to enjoy a career that allows me to have an impact on their lives. I am forever grateful to Mount Union for developing the core foundation that facilitated my career to get me to this point, allowing me to provide the highest quality of care for my patients each day.